I bought a new pair of shoes yesterday....actually two pairs of shoes, remember...this post. I don't normally shop the Black Friday sales, but I went along for the ride with my daughter and her family. Their destination....the outlet mall to shop for some previously sighted shoes that could possibly be on sale! Guess who walked out with shoes in her hand...yeah, that would be me. 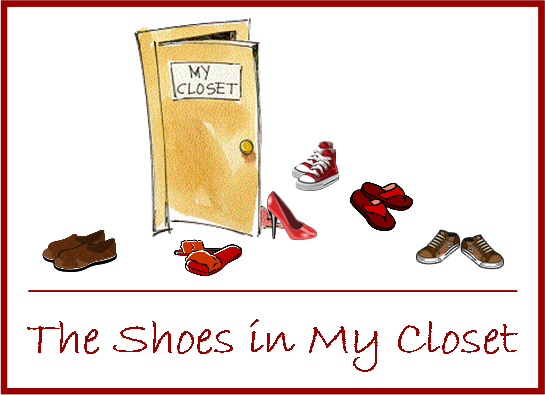 There's always a need for more "shoes in my closet"! The last fifteen months have been a very busy time in my life (there has been no time for blogging). Never before have I traveled so much....a trip for a baby shower...a quick trip to Amsterdam meeting up with my world-traveling, hardworking, steel-toed boot wearing husband...an extended visit in Mississippi after the birth of a grandchild...and several antique shopping excursions. We were so excited to welcome two new lives into this world....a granddaughter and a grandson...our family is growing. We moved my mother to an assisted living center...not an easy transition at all , but the perfect choice. God has blessed us beyond any expectation....doesn't He always give greater than we could ever imagine? This next year won't be any different, at least not in the manner of busyness. There will be another grandchild addition in January (this will be our fourth)...there will always be transitions to make with my mother as she ages....and there will be more traveling....lots of it! In fact, I have considered borrowing some shoes with wings from the FTD florist logo, Mercury Man. I am hoping that you will put on your imaginery, winged shoes and go with me on a journey. I promise to always be camera ready. Through this media, I can take you along as I move to Baku, Azerbaijian to join my world-traveling, hardworking, steel-toed boot wearing husband who has been working there, traveling back and forth, for the last year. I will be traveling to the states often to visit grandchildren (and of course, my children), to care for the needs of my mother, and to get a taste of the familiar, translated as Whataburger, PeiWei, Saltgrass, and of course, mexican food. We leave shortly after Christmas, so not only do I need to decorate for Christmas and have lots of shopping to do in the next few weeks, I will be making preparations (packing shoes, of course) to begin this new adventure. I am a bundle of nerves! I am excited! I am blessed!